To better understand climate change and global warming, researchers realize that they must address carbon emissions. A new study suggests using deep saline aquifers that are more than half a mile below the Earth’s surface, far below the freshwater sources used for human consumption, as a storage place for the would be liquefied carbon dioxide. 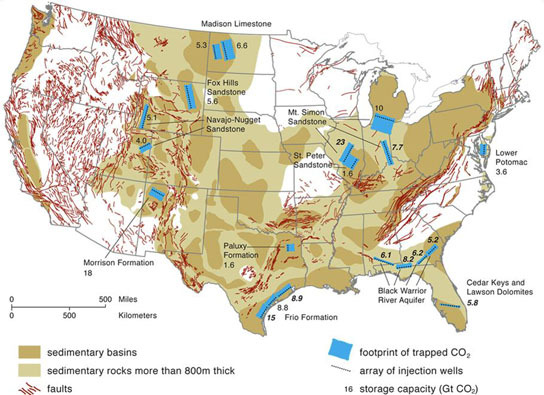 A new study by researchers at MIT shows that there is enough capacity in deep saline aquifers in the United States to store at least a century’s worth of carbon dioxide emissions from the nation’s coal-fired powerplants. Though questions remain about the economics of systems to capture and store such gases, this study addresses a major issue that has overshadowed such proposals. The MIT team’s analysis — led by Ruben Juanes, the ARCO Associate Professor in Energy Studies in the Department of Civil and Environmental Engineering, and part of the doctoral thesis work of graduate students Christopher MacMinn PhD ’12 and Michael Szulczewski — is published this week in the Proceedings of the National Academy of Sciences. Coal-burning powerplants account for about 40 percent of worldwide carbon emissions, so climate change “will not be addressed unless we address carbon dioxide emissions from coal plants,” Juanes says. “We should do many different things” such as developing new, cleaner alternatives, he says, “but one thing that’s not going away is coal,” because it’s such a cheap and widely available source of power. Efforts to curb greenhouse gases have largely focused on the search for practical, economical sources of clean energy, such as wind or solar power. But human emissions are now so vast that many analysts think it’s unlikely that these technologies alone can solve the problem. Some have proposed systems for capturing emissions — mostly carbon dioxide from the burning of fossil fuels — then compressing and storing the waste in deep geological formations. This approach is known as carbon capture and storage, or CCS. One of the most promising places to store the gas is in deep saline aquifers: those more than half a mile below the surface, far below the freshwater sources used for human consumption and agriculture. But estimates of the capacity of such formations in the United States have ranged from enough to store just a few years’ worth of coal-plant emissions up to many thousands of years’ worth. The reason for the huge disparity in estimates is twofold. First, because deep saline aquifers have no commercial value, there has been little exploration to determine their extent. Second, the fluid dynamics of how concentrated, liquefied carbon dioxide would spread through such formations is very complex and hard to model. Most analyses have simply estimated the overall volume of the formations, without considering the dynamics of how the CO2 would infiltrate them. The MIT team modeled how the carbon dioxide would percolate through the rock, accounting not only for the ultimate capacity of the formations but the rate of injection that could be sustained over time. 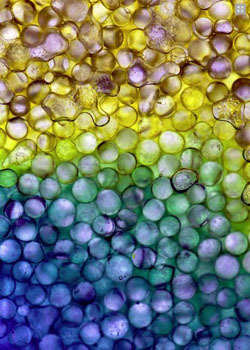 “The key is capturing the essential physics of the problem,” Szulczewski says, “but simplifying it enough so it could be applied to the entire country.” That meant looking at the details of trapping mechanisms in the porous rock at a scale of microns, then applying that understanding to formations that span hundreds of miles. “We started with the full complicated set of equations for the fluid flow, and then simplified it,” MacMinn says. Other estimates have tended to oversimplify the problem, “missing some of the nuances of the physics,” he says. While this analysis focused on the United States, MacMinn says similar storage capacities likely exist around the world. When liquefied carbon dioxide is dissolved in salty water, the resulting fluid is denser than either of the constituents, so it naturally sinks. It’s a slow process, but “once the carbon dioxide is dissolved, you’ve won the game,” Juanes says, because the dense, heavy mixture would almost certainly never escape back to the atmosphere. While this study did not address the cost of CCS systems, many analysts have concluded that they could add 15 to 30 percent to the cost of coal-generated electricity, and would not be viable unless a carbon tax or a limit on carbon emissions were put in place. The research was supported by grants from the U.S. Department of Energy, the MIT Energy Initiative, the Reed Research Fund, the Martin Family Society of Fellows for Sustainability and the ARCO Chair in Energy Studies. 1 Comment on "Storing Carbon Emissions in Deep Saline Aquifers"
Yeah. and then that report on earthquakes caused by CO2 injection….